• PLOT SUMMARY: Where were you when Captain America died? It's the anniversary of the day Steve Rogers was killed, a day of reflection and mourning in the Marvel U...a time to look back on the things Steve did and what he stood for... or is this actually the beginning of the most wicked plot twist since issue 25? Yeah, actually it's both. Plus, Sharon Carter's dreams are forcing her to relive the death of Steve Rogers -- and her time under the control of Dr. Faustus. But will these dreams also reveal hidden secrets about what she saw and did on the day Steve died? Also, Bucky Barnes is the new Captain America now...but today he's trapped in the past, because today is Bucky Barnes' birthday. See Bucky's favorite and least favorite birthdays - from the cold winters of the Depression on military bases, to the front lines of WW2, to his new mission as Cap. Plus, a double-sized story by the legendary Gene Colan about Cap and Bucky's days in WWII. Collects Captain America (2004 5th Series) #49-50 and 600-601. Written by Ed Brubaker. Art by Luke Ross. 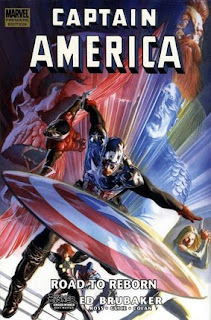 Cover art by Alex Ross. Hardcover, 176 pages, full color.